Please help us raise money for Cabot! Cabot Westside Health Center is part of the St. Luke’s system and located near our office in the Crossroads district in downtown Kansas City. Cabot is a unique hospital that not a lot of people seem to know about, though they’ve been here since 1906 – they are a non-profit that serves the needs of anyone that comes in the door, regardless of their ability to pay. They see an average of 7900 patients per year, and about half of those are children. They offer both medical and dental care. Every staff member is fluent in both English and Spanish. For many people Cabot makes the difference in receiving healthcare or not, sometimes when it’s desperately needed. Cabot has historically run on grant funding and not established a donor program, but costs of supplies combined with an increase in patients has produced a shortage in funds, and they needed to establish a donor program that can remain in place for years to come. Working with our Crossroads neighbors and friends, Meers Advertising, Westside Studio and Prizm Productions, we’ve already crafted digital and print assets for an interactive new “Cabot Cares” campaign. We’re now doing the foundational work of establishing a presence for them online so people can learn more about them, reach someone on various social networks, and share the information about the good work Cabot does in the community, so we can help them raise funds to continue providing these services. We need your help, though, to get the word out about Cabot, what they do, how they help keep Kansas City healthy and why every donation matters, no matter how large or small. Will you please tweet, Facebook or blog about Cabot and encourage others to do the same? The babies, kids and adults they see as patients everyday will be so grateful for your support! First Friday folks! Please checkin to places you visit on Nov 5th via Foursquare. When you do, Missouri Bank donates $1 to @CabotCares! 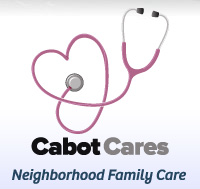 Your healthcare donations mean a lot to @CabotCares! Please visit http://bit.ly/donate2cabot to learn what a few dollars can provide. If you’d like to interview our CEO Lisa Qualls or Cabot’s Executive Director Liz Cessor about this campaign, please contact us at 816-359-3554 to arrange it! Cabot Cares about Kansas City. Thank you for helping us show that Kansas City cares about Cabot!